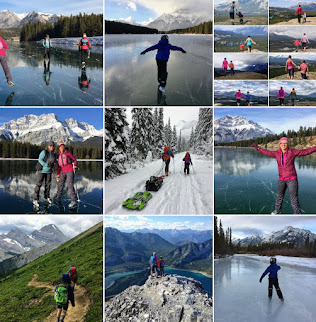 Continuing with my series on Family Camping Made Easy, we move on from the night time hours where I discussed warm sleepers are happy sleepers, to the daylight hours where I'll discuss everything from naps to entertainment, safety, packing, hygiene and backcountry travel. Today I'm going to start with the youngest member of your family - your infant or baby - possibly out for his or her first camping trip. How do you plan for that epic return to camping (it sure feels epic anyway) - this time with a baby on board? We didn't actually take our son camping until he was six months old but I've talked to other families who've been out with their infants and we agree that the number one thing you need to bring camping with you for the youngest camper in your family is the play pen, the Pack 'N Play or the play yard - whatever you call it. (they're all the same thing) You'll want to bring some kind of enclosure with four walls that you can put your babe in to sleep, nap, or play. It keeps the child safe while you are cooking, chopping wood, or otherwise busy with camp chores. It gives the child a comforting place to sleep that reminds them of their crib back home. 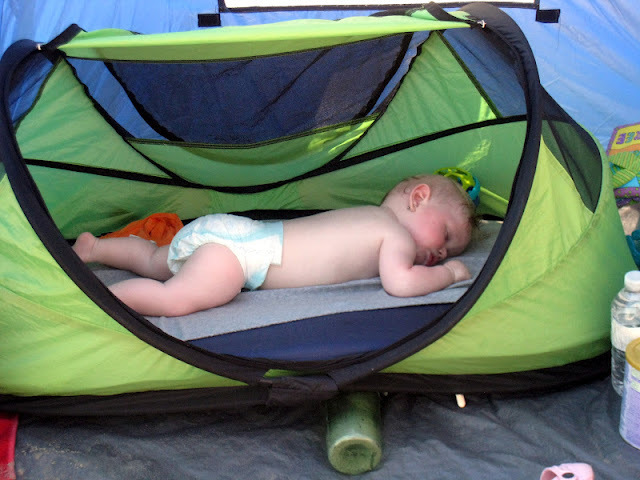 It also gives your child a place to take naps mid day when the tent is too hot under the sun's warmth - Just put the play pen under a shaded tree with some mosquito netting over top and you're good to go. It gives your child a bit of variety too rather than sitting in their stroller the whole time. For something a little different but along the same lines, check out the Kidco PeaPods. We used one for our son when we traveled to Hawaii on vacation because he had outgrown his playpen but wasn't ready to graduate to a big bed yet. A PeaPod is like a little tent that babies and toddlers can sleep or nap in when on the go. My friend brings hers to the beach and puts her youngest in it to nap while her older daughter plays. Amelia at Tales of a Mountain Mama did a review on the PeaPod so you can visit her website at the above link if you'd like to read the review. This isn't an essential item but Alyssa from the Kid Project brought it to my attention in one of her recent posts. Follow the link above to her website to see some extremely cool photos of a very happy child jumping to his heart's content while their jolly jumper hangs from a tree in their campsite. 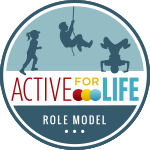 They even use it when they go rock climbing to entertain their youngest child. What a fabulous idea! If you have lots of room in your truck you could also bring an exersaucer. Though the base will take up more room in your vehicle than a simple jolly jumper, you won't need to search for a campsite with a big sturdy tree - always a plus. This is the best invention for babies ever!! They're expensive (so try to find one used) but invaluable. 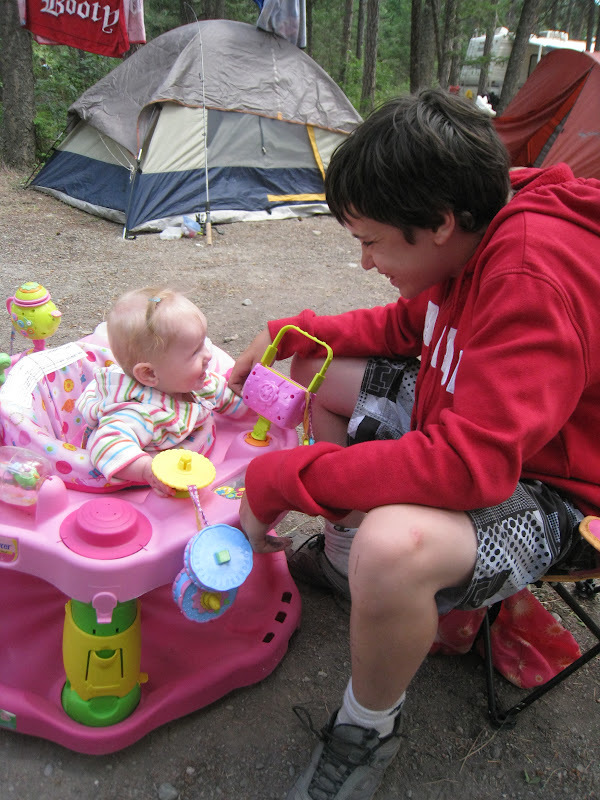 You can put Junior in his little Bumbo chair and just let him watch the action around the campsite for hours. My son loved his and they even come with little trays for feeding snacks. Again, these are items you likely have at home so just pack them in the truck and set them up at the campsite. I'd throw a tarp or big blanket under the gym to keep the material clean but otherwise - good to go. They don't take up much room and can seriously entertain a baby for hours (at least mine loved them). Both toys are manufactured by many different companies so you can buy your preferred brand. This barely needs mentioning because if you are a baby wearing mama, there's no way you'd leave home without your carrier or sling. There's far too many models to mention here so I'm merely adding it to this post so that you remember to put it on your packing list. While we didn't use carriers much with our son, I believe they could be extremely useful in camp. Imagine you're trying to do chores around camp (not chopping wood presumably) for example and have a fussy baby on your hands or you need to accompany older kids to the playground. 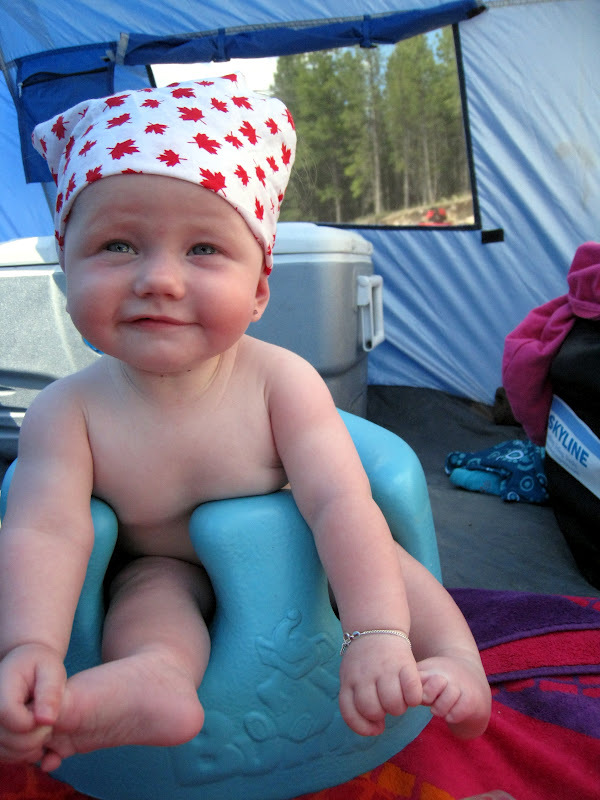 Moms and dads in support of baby wearing know that it's often the easiest way to keep your baby feeling secure, safe, and happy - important when your baby is in a strange environment camping for the first time. This mom knows how to travel with kids! If your child is anything like my son, they'll wake up at 5am and it doesn't matter that it's cold outside, you're still tired, or that you don't feel like making breakfast yet - you're up! Bring the stroller and you can at least push your child around the quiet campground. I once took my coffee with me and pushed my son down to the lake where we spent some quiet time watching the sun come up. That might be my only good memory of the early wake-up calls. Most of the time I made my husband get up and walk our son around, good camping princess that I am. I seriously wouldn't expect you to bring all of the items above but pick your child's favourite item or two for some comfort at camp - it's all about comfort and security. Bring a large tarp or blanket to spread on the ground with some of your child's favourite toys. It keeps your child clean (if that's important to you) and lets them actually move around out of their restraining devices, carriers and strollers. We used our screen house last summer as a dry warm place in which to change our son's diaper, store clothes and gear we didn't want to get wet, to eat or play under when it was raining, and to store our lawn chairs, stove, and other camp items when we were out on a day trip. I can't imagine camping more than a night without it. You'd be surprised at the amount of shade an umbrella can provide for small children. When my son was smaller, we'd set one up on a blanket (see the photo below) when we were outside in a park having lunch, watching a concert, or chilling on the grass. Instant protection from the sun. - and much cheaper than an actual beach tent. The photo says it all. Great place to let the little ones chill while you make dinner or tend to the fire. Don't feel bad if you aren't ready to try sleeping in a tent with your baby yet. I don't plan on covering the whole topic of trailers, campers, and RVs in my camping series but my son and I slept in the back of our truck on all of our first camping trips. We built a simple wood platform for the back of the truck, bought a topper, and voila - easy trailer with zero set up. We put a large air mattress in the back of the truck and my son and I would sleep side by side there together. We were toasty warm and blissfully happy while Dad had to sleep outside in the cold tent. For more information on keeping small children warm at night, see my last post in this series, Warm sleepers are happy sleepers. Follow the link below for the next post in this series on camping with toddlers and preschoolers. Just checked out your blog Kate. Great job. Love the Peapod photos too. E-mail me at koob.tanya@gmail.com - would love to chat more. We took our daughter camping at 2 months and brought only a peapod and the Ergo carrier (sorry, I never got around to sending you a pic). The peapod was great for in the tent (has it's own thermarest, essentially) and outside. I believe it also has a UV protection rating when closed, which was nice for non-shaded areas. I was a baby wearer anyway, but I was totally freaked out to be more than 4 feet from her while camping at that age so it got a lot of use. When she got older the pack-n-play was a must, as you said. I like the idea of a screen house. We will have to look into getting one. Glad so many people are using peapods. They really are great. By the time we got one for my son he was too big for the one we had bought. We should have bought the plus model. Thanks for the reminder. I am aware of the safety precaution/advisory with pea pods with children under the age of One. I already had a warning in another post but forgot about the mention of the pea pod in this post. I have placed the following warning in the post: *Please note that there has been a safety advisory issued for the Kidco Peapod by Health Canada. If you plan to use it for a child under one year of age, please read the warning before purchasing one of these products. I am choosing not to remove all mention of the pea pod in my former posts since the safety concerns seem to primarily involve infants. Parents of toddlers can choose for themselves what they feel comfortable with. I know I felt very safe using one with my son when he was a toddler. This is very cool. We have a toddler and love to camp but figured it would be several years before it was feasible. We will definitely look into some of these items. As an auntie who loves to camp, this is awesome. I found your blog through Pinterest and now I need to read all of your posts! Thanks for your comments Melanie. I had to change my comments to preview them first because I was getting too much spam every day. Glad you are a camping auntie and loving it. Loved reading your blog! However, I am NOT a camper. You are a brave Momma! Thanks. I don't know about brave, but we do like camping. We've taken our boys camping since they were infants (3 months our& 1 month) and they both love it. We have a standard campground here and an older cousin that usually helps guide them but they're seasoned campers at 5 & 2! We camped in Colorado last summer & we all had a great time! Thanks. Glad you are getting your kids outside. Btw I have taken many a stroller walk around a campground in the wee hours. When the grass is still covered in dew & there's little noise but chirping birds. If people don't have a screen room I'd recommend at least a canopy. It works good for hiding under during rain showers & for keeping acorns from falling on your kids! We took my oldest camping labor day when he was only six months and wasn't crawling or walking. We put him down on the big blanket under the canopy so he was in the shade but wouldn't get bonked on the head or face. You can get decent ones at Walmart starting at 50 bucks. Happy camping this summer! Thanks for your comment. Happy camping to you this summer as well. I tried camping without a baby carrier once and ended up fashioning one out of a bed sheet! Please though, do not use critch danglers! Check those bumbo seats they were recalled a while back and you need the straps that you can get from the company. Just want to keep those babies safe. Thanks Holly. Not having an infant anymore, I don't keep up with all the recall information anymore. Personally, I never found how a child could get hurt if they were sitting in their Bumbo on the floor and happened to crawl out, but I respect the company's safety warnings and will make sure I put a note in this blog post to the warnings. One thing that I cannot wrap my head around when it comes to camping with a baby/toddler is where do you put all of that STUFF? I mean, how do you physically transport kid(s), carseat(s), the usual camping necessities plus a big stroller, pack n' play, toys, kid seats/highchair, screen tent, diapers etc... We drive a station wagon that is packed full when we go camping just the two of us. We'll probably invest in a roof rack this year for some extra space but no way will we be able to fit ALL that stuff! Any tips for minimizing? We've always taken a truck camping and filled it to the max. No idea how to do it in a smaller vehicle. Roof racks and Thules are awesome though! And otherwise, yeah, ya gotta choose what is most important to you because you can't take it all. One idea is to camp with friends and try to split up some of the communal stuff like screen tent, stove, etc. Also, try to bring items that have more than one purpose. Example, a stroller can be used for sitting in around the campfire instead of a lawn chair, it can be used to eat in maybe instead of a high chair, etc. And we've used kiddie lawn chairs with the kids eating off of the picnic benches instead of bringing booster seats. We're getting a roof rack asap, and then the highchair is the next big challenge. Thanks for the suggestions! Hope that helps for anyone on the fence about it! Thanks Maria. I'll check out your blog. 1. Carseat to sleep in for infants. This is controversial, so each parent needs to decide for themselves, but it's a great way to keep them snuggled, warm, and the bug netting securely in place (we live and camp in an area of the Rockies that has had a lot of cases of West Nile). 2. Hammocks work great for getting infants off the ground, but out of arms. We always used the netted, hanging ones that cocooned the baby, so there was no way for the baby to roll out or suffocate. 3. Really little ones should not be covered in deet, so if you frequent somewhere with a lot of mosquitos, a non-deet bug repellent is a must as is mosquito netting. 4. BABY WIPES. Especially for toddlers who can and will explore in the dirt. They get filthy! Thanks for your comments. I've heard of several families using a carseat so I'm sure you aren't alone there. Had never thought of using a hammock with a baby. Great idea too. Agree, we never used bug spray on our son when he was a baby. Mosquito netting over strollers is a popular choice for families. I've seen families put it over play yards too. And yes, we still carry giant Costco size packages of baby wipes with us when we go camping. Probably will for the rest of our lives now. Such an awesome product. I'll keep these ideas in mind when I do more Family Camping Made Easy posts next summer. I plan to do a giant post with general tips. Some of these would be great. Lot's of fun here. I recall camping with my first-born at Yellowstone when he was about 3 months old. It was at almost 12,000 feet in elevation and COLD. We were all bundled up. My wife and I stayed awake all night making sure he was comfortable and didn't get chilled. Only one of us slept that night - the baby (happily) snug in his coverings. I later recalled our pediatrician saying "if you're comfortable, the baby is comfortable). He was plenty warm, we were just over-worried. He was in his car seat, but this was before that became a controversial practice. Thanks Michael. I know lots of people who have used car seats in tents. Can't imagine why it's a bad idea. There's a concern of baby sleeping with his chin on his chest and constricting the airway. For folks who still want to use the carseat but are concerned, check out the Respisense (it can sometimes be found on baby.steals.com for half price - their shipping rates to Canada aren't great, but if you buy enough it balances out). It's a similar idea to the AngelCare monitor, but attaches to baby's diaper. I haven't tried the product myself, but I know the AngelCare gave me a lot of peace of mind when we moved our daughter in to her own room, so I'd imagine this may help others! We took our daughter camping twice in her first year (at 2 and 3 months). We're normally tenters, but took advantage of my parents' tent trailer and kept her in the bassinet from the stroller between us. The best thing we brought with us was lots of extra hands to help with all the camp related stuff so I could focus on baby. We also brought her swing, as it was the only non-mommy device that she'd hang out in for an extended period of time (and when combined with the stroller took up more than half the bed of the truck - we were very thankful we didn't have to pack our usual supply list and could mooch off my parents). This year we're investing in a PeaPod and hope it keeps our independent toddler contained! Hope you like the peapod. My son liked his for a while when we used it for traveling. Friends swear by theirs. What brand of screen tent is that? My daughter is 1 year and I'd like to get back into camping. I think I need a bit more comfort! It's a Nordic cross screen tent. It worked really well for us before we got our trailer. That's been our final jump into comfort! The screen house is a lifesaver in buggy conditions! We kept putting it off because I thought they were for wimps, but kids just don't want to stay covered up, especially when it's hot, and you can't put loads of bug spray on them. We finally got the screen house last year and when the mosquitoes were swarming in Dinosaur Prov Park, I admitted it was worth every penny (and the lost cargo space). Agree Karen that screen houses are crucial when it's raining or super buggy. With our first child, we used the pack n play for him the 1st (~6m) & 2nd (~1.5yrs old) summers camping. Now we have twins and have gone camping with them 3 times this summer (starting at about 3.5 months old). This time I coslept with them (they were at the end of the tent, then me, my older child, then husband ). I know some people aren't comfortable with cosleeping, so this wouldn't work for them, but it has been so much easier than with the pack n play. I could breastfeed them easily at night without leaving the covers and could check on them easily. The hardest part was "exchanging" babies for feeding, but most people wouldn't have this problem. I imagine once they are more mobile next summer, we will go back to the pack n play. Otherwise, we bring a stroller, 1 bumbo chair, a sun tent, & a blanket/tarp for rolling around on. So awesome. I've been looking for a swing for my kids but didn't want to buy the fabricated ones because they cost so much and where we live (kenya) they are mostly made of steel which I hate. This is such a great idea for my one year old. Thanks so much for the inspiration. wow excellent post. The information in this blog is extremely useful for the baby's mother. 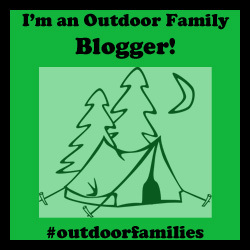 I enjoyed reading your blog but I am still not sure about camping with Kids. Thanks a lot for sharing your experience. You have to try it at least once before ruling it out. :) Go with a supportive group of friends and you'll most likely have a good time. Comfort camping is also a good way to get started with a yurt, cabin, tipi, etc. Yes, a playard is actually very important for camping. They are very handing when going travelling. And as they can be used as a crib or a bassinet, it actually decreases the tension a lot. And nowadays, playards come with toy bars, or music systems with beautiful lullabies which makes the baby feel like he/she is at home. Thus, they can sleep peacefully within a playard. Thanks for the info! I enjoyed reading your blog.We didn't have a screen house for our camping trips last year, and I think that was probably a mistake. This is such a great idea for my one year old. Thanks so much for the inspiration. It's one of the best Post about camping with baby.thanks for the share.but I think I need a swing for my baby and it will make easier camping. what swing will recommend for 2 years old baby? I'm not sure. I imagine a 2-year old could use a normal baby swing that you'd find in playgrounds at many campgrounds. At the campsite itself though, I'm afraid you'll have to do some research on that one. 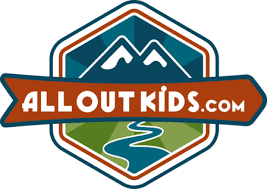 Very knowledgeable & inspirational camping for kids! Thank you Tanya Koob for this kind of article.